The perfect gift for the car care enthusiast! The Wolfgang Complete Car Care Kit is filled with Wolfgang car care products and detailing supplies to put a head-turning shine on any vehicle. This bucket includes 16 pieces at an incredible value! The Wolfgang Complete Car Care Kit makes an excellent gift for a new car owner, a new driver, someone that is new to detailing, or anyone looking for a set of great detailing products at a great price. The Grit Guard works by trapping dirt below the grid. Silky suds, a pleasant scent and excellent lubrication – what more could you ask for in a car wash? Wolfgang Auto Bathe bathes your vehicle in rich suds that lift dirt and grime away from the paint without leaving a trace. Natural oils and polymers wrap around dirt to remove it from the paint without scratching. 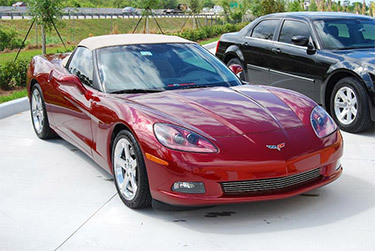 Wolfgang Auto Bathe will leave your vehicle looking clean, shiny, and vibrant. Wolfgang Instant Detail Spritz will reactivate the gloss of the existing paint sealant with its high-tech German super polymers. These highly-reflective polymers form an ultra-thin protective coat that bond to the paint sealant or wax finish and leave your vehicle with a slick, silky surface – like it was just detailed! Plus, Instant Detail Spritz extends the life of the sealant or wax with regular use. These Microfiber Towels are made of split weave 70/30 microfiber, the softest blend available. One side has a loop structure for cleaning and polishing; the other side is soft and fluffy to buff away waxes or quick detailers. Most importantly, these Microfiber Towels are nonabrasive, just like all microfiber products we carry. These towels are handy for polishing, buffing, cleaning and all the other tasks for which you depend on quality microfiber towels. Feel the softness of microfiber chenille! The Cobra Blue Micro-Chenille Wash Mitt is made of thin microfibers woven into plump, caterpillar-like strands that are both absorbent and nonabrasive. This mitt is more durable than the finest sheepskin mitt and it has the incredible softness of microfiber. You can depend on the Blue Micro-Chenille Wash Mitt to wash your vehicle gently time after time. Green Medium Flex Foam Finger Pockets are the easiest way to clean or polish tight places. These foam pockets fit over three or four fingers so you can maneuver in small spots. The foam has light cutting power so its perfect for polishing metal components. Green Medium Flex Foam Finger Pockets allow you to reach between the slats in your vehicle’s grill or between spokes. First, fill the bucket with an ounce of Wolfgang Auto Bathe and water. Use the Super Plush Micro-Chenille Mitt to wash your vehicle from the top, down. You can use the Grit Guard in the bucket to agitate the mitt and release dirt from it. Next, use the Guzzler to gently dry the vehicle. Dry the windows and large, flat panels first since water spots are more noticeable in these areas. The Microfiber Towels can be used to wipe down door jambs and to towel-dry wheels (which can also get water spots!). Apply a coat of Wolfgang Deep Gloss Paint Sealant using a Finger Pocket. Apply the sealant to the entire vehicle. Wait about 30 minutes and buff it off using the Supreme 530 Microfiber Towel. For maximum protection, allow the sealant to cure for 12 hours before exposing the paint to water or applying any products on top of it. As needed, use one of the Supreme 530 Towels to apply Wolfgang Instant Detail Spritz. This will keep the paint looking just-detailed for weeks longer with regular use. A total retail value of $180.87. Save $50.88! 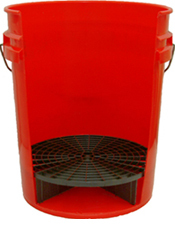 The bucket is available in red, black, and clear. Please choose a color in the drop-down menu below. Everything I need to keep my 26 year old Porsche 964 Cabriolet looking great. Works on my daily driver as well. Get one!